In his original comic book iteration, Hawkman is the spirit of ancient Egyptian prince Khufu reincarnated in the body of archaeologist Carter Hall. Using archaic weapons and ancient technology to fight crime, the mysterious fictional Nth metal allows him to defy gravity and fly. This winged superhero is often accompanied by his partner and fellow reincarnated Egyptian, Hawkwoman, both frequent members of the Justice League. Appearing in comics, cartoons, and movies since 1940, Hawkman has recently been featured in live-action television shows such as Arrow, The Flash, and Legends of Tomorrow. At Superheroes Direct, we bring you collectibles and apparel depicting a variety of Hawkman incarnations, from classic comic book styles to his most modern looks. Keep checking back here for additions to our selection of Hawkman gear. Incorporate your love of action-packed comic books into your school or office supplies with a fun set of pencil toppers! 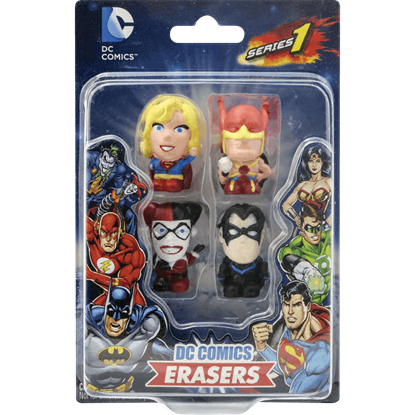 This DC 4 Pack Eraser Set makes four of your favorite characters just the right size to fit atop your pencil.